Bobby Bare, and what was to become known as The Nashville Sound, go hand in hand. He was one of the most successful exponents of the sound and it opened up the doorway for his success in Nashville..He was born Robert Joseph ‘Bobby’ Bare on April, 7th 1935 in Lawrence County, Ohio and raised on a farm. In his early teens he first envisaged himself as an entertainer. 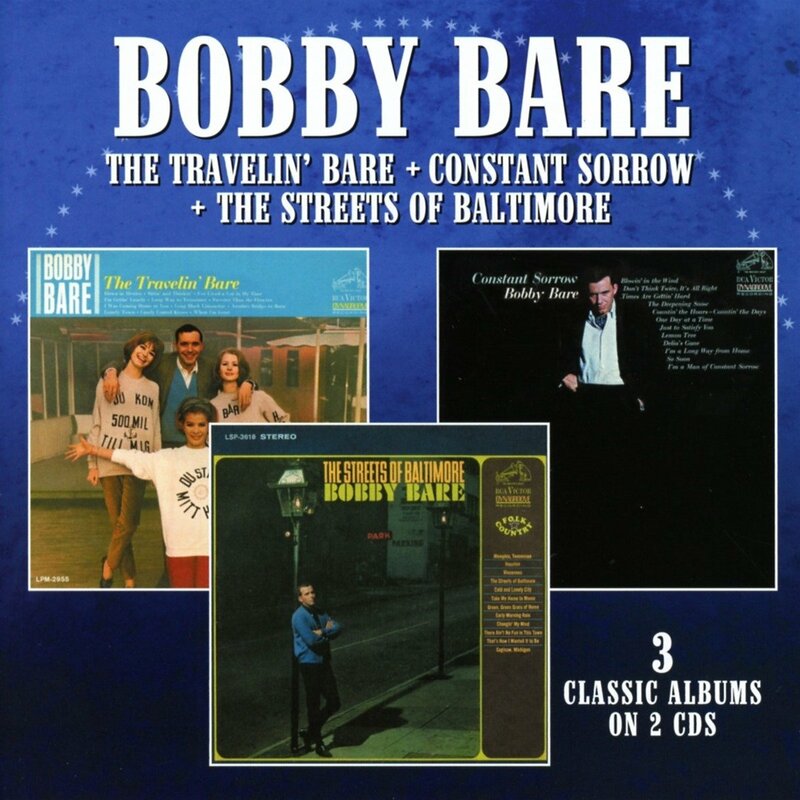 That’s when he started listening to the live radio shows and to the records of Hank Williams, Carl Smith, Ernest Tubb and Frankie Laine..The three albums in this collection “The Travelin’ Bare” (1964), “Constant Sorrow” (1965) and “The Streets of Baltimore” (1966) perfectly fitted RCA’s Folk/Country marketing tag. The recordings covered a diverse music field that moved from Dylan and 60s pop culture to Nashville’s new breed of writers like Harlan Howard, Willie Nelson and Hank Cochran, plus a few of his own originals thrown into the mix. .The albums give an early indication of Bare’s ability as a talented judge of songs, a skill that led Waylon Jennings to later cite him as the best songhound in the world..He achieved 69 chart singles and 28 chart albums – an illustrious career..In 2013 he received Country Music’s highest honour – induction into the Country Music Hall of Fame..All three albums appear on CD for the first time.